Shahverdi, A., Moradkhani, R., Mirjani, R., Alimirzaee, P., Monsef Esfahani, H., Iranshahi, M., Gohari, A. (2007). Enhancement Effect of Berberis vulgaris var. integerrima Seeds on the Antibacterial Activity of Cephalosporins against Staphylococcus aureus and Escherichia coli. Iranian Journal of Pharmaceutical Sciences, 3(3), 181-186. Ahmad R. Shahverdi; Reza Moradkhani; Roholah Mirjani; Parinaz Alimirzaee; Hamid R. Monsef Esfahani; Mehrdad Iranshahi; Ahmad Reza Gohari. "Enhancement Effect of Berberis vulgaris var. integerrima Seeds on the Antibacterial Activity of Cephalosporins against Staphylococcus aureus and Escherichia coli". 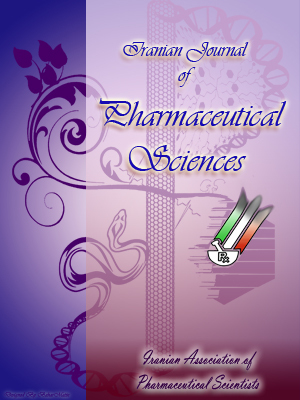 Iranian Journal of Pharmaceutical Sciences, 3, 3, 2007, 181-186. Shahverdi, A., Moradkhani, R., Mirjani, R., Alimirzaee, P., Monsef Esfahani, H., Iranshahi, M., Gohari, A. (2007). 'Enhancement Effect of Berberis vulgaris var. integerrima Seeds on the Antibacterial Activity of Cephalosporins against Staphylococcus aureus and Escherichia coli', Iranian Journal of Pharmaceutical Sciences, 3(3), pp. 181-186. Shahverdi, A., Moradkhani, R., Mirjani, R., Alimirzaee, P., Monsef Esfahani, H., Iranshahi, M., Gohari, A. Enhancement Effect of Berberis vulgaris var. integerrima Seeds on the Antibacterial Activity of Cephalosporins against Staphylococcus aureus and Escherichia coli. Iranian Journal of Pharmaceutical Sciences, 2007; 3(3): 181-186. To evaluate the enhancement effect of Berberis vulgaris var. integerrima seeds on the antibacterial activity of cephalexin and ceftizoxime against Staphylococcus aureus and Escherichia coli ethanol extract of the seeds were prepared. Disk diffusion and broth dilution methods were used to determine the antibacterial activity of two cephalosporins in the absence and presence of the extract and its various fractions separated by TLC. Clinical isolates of Staphylococcus aureus and Escherichia coli were used as test strains. Total extract and one of its fractions enhanced the antibacterial activity of cephalexin and ceftizoxime. The active component of the extract involved in the enhancement of cephalexin and ceftizoxime antimicrobial activities had an Rf of 0.47 on TLC and a λmax of 209 nm. The highest fold decrease in MIC was observed for ceftizoxime plus the active fraction of the extract against Escherichia coli. Our preliminary results on the column chromatography and identification of the active component by high resolution mass spectroscopy showed that this minor compound may be categorized as a protoberberine structure compound. Therefore, the ethanolic extract of Berberis vulgaris var. integerrima seeds combined with cephalosporins may be useful against Staphylococcus aureus and Escherichia coli. Most of the progress in the 20th century modern medicine in surgery, cancer chemotherapy and organ transplantation is attributed to the use of antibiotics . The emergence and dissemination of resistant bacteria to antibiotics, however, are major health problems leading to drawbacks for a large number of drugs [1, 2]. Consequently, there has been increasing interest in the use of inhibitors of antibiotic resistance for combination therapy . This approach suggests co-administration of antimicrobial agents with an inhibitor to inhibit or deactivate the resistance mechanism of the microorganism, and increase the effectiveness of the antimicrobial agents. This approach has the advantage of extending the usefulness of antibiotics with known pharmacological, toxicological and treatment properties [4, 5]. In this regard, interest has increased in plant-based natural products to combat infectious diseases [6-8]. The natural product reserpine is known to inhibit the multi-drug transporter NorA and to enhance the activity of norfloxacin, a flouroquinolon antibiotic . We have been screening various plants for their ability to decrease bacterial resistance to cephalosporins, which are extensively used to treat infections caused by different bacteria. An extract prepared from the Berberis vulgaris var. integerrrima seeds (BVIS) was selected for further investigation. Enhancing effects of the extract and its active component on the antimicrobial activity of cephalosporins were evaluated against Staphylococcus aureus and Escherichia coli. UV spectra were acquired on a Cecil model CE 9200 spectrometer, using ethanol (Merck) as solvent. Cephalexin and ceftizoxime were provided by Sigma Chemical Co.
Fresh Berberis vulgaris var. integerrima fruits (Berberidaceae) were purchased from a local market in February 2005, and were authenticated by Dr. F. Attar. These fruits’ seeds were collected and pulverized (50 g). The ethanol extract was prepared by macerating the powder for 48 h with three changes of solution at the room temperature. The combined solvent extracts were evaporated to yield a brownish, viscous residue (5.8% yield). The extract was fractionated by thin layer chromatography (TLC) on silica gel (60F 254 Merck) using chloroform-methanol (85:25) as the solvent system. The fractions were visualized under UV at 366 nm and were eluted using ethanol (Merck). A disk diffusion method was used to assay the ethanolic extract of BVIS and its TLC fractions for bactericidal activity against test strains on Müeller–Hinton Agar (MHA) plates . To assay the enhancement of antimicrobial activities, a sub-inhibitory concentration of cephalexin (2 μg/ml) and ceftizoxime (0.04 μg/ml) was separately added to the plates. A single colony of test strains was grown overnight in Müeller–Hinton Broth (MHB) on a rotary shaker (200 rpm) at 35 °C. Clinical isolates of S. aureus and E. coli from our collection were used. The inocula were prepared by diluting the overnight cultures with 0.9% NaCl to a 0.5 McFarland standard and were applied to the plates along with the disks containing the ethanol extract of BVIS and/or its different TLC fractions. After incubation at 35 °C for 18 h, the inhibition zones were measured. The assays were performed in triplicate. Figure1. Agar disk diffusion assay testing the effect of Berberis vulgaris var. integerrima seeds’ ethanolic extract (10 mg/disk) against Staphylococcus aureus in the presence and absence of cephalexin. Staphylococcus aureus was spread onto Müeller–Hinton Agar containing 2 µg/ml cephalexin (left plate) and without cephalexin (right plate). Disks impregnated with BVIS ethanolic extract (A) or ethanol (B) were placed onto the inoculated agar plates. On the plate containing 2 µg/ml cephalexin (left plate) higher antibacterial activity was observed with BVIS ethanol extract than with a control. Table 1. Enhancement of antimicrobial activity of cephalexin and ceftizoxime against test strains by ethanolic extract of Berberis vulgaris var. integerrima seeds (5 mg/disk). aPlates contained sub-inhibitory concentrations of tested antibiotics. bMean surface area of the inhibition zone (mm2) was calculated for each tested antibiotic from the mean diameter. Fold increase for cephalexin was calculated as (b2-a2)/a2, where a and b are the areas of inhibition zones for A and B, respectively. In the same way (c2-a2)/a2 was used for ceftizoxime (C). cIn the absence of bacterial growth inhibition zones, the disks’ diameters (7mm) were used to calculate the fold increase in columns 5 and 6. Susceptibility tests were carried out by the standard broth micro-dilution method in accordance with the NCCLS guidelines 2000  in MHB with an inoculum of approximately 103 colony-forming units (CFU)/ml . The MHB was supplemented with serial antibiotic concentrations ranging from 0.0156 to 16 µg/ml, and constituent the active fraction (M47) at concentrations from 0.0625 to 1 mg/ml. The data were reported as MICs, the lowest concentration of antibiotic and M47 that inhibited visible growth after 24 h of incubation at 37 °C. To evaluate the component M47’s effect in combination with antibiotics, increasing concentrations (with a twofold step, i.e., 0.0156, 0.0312,…, 16 µg/ml) of cephalexin and ceftizoxime were added to MHB containing constituent M47 at 0.1×MIC. Tubes containing an identical amount of MHB but free from antibiotics and M 47, and tubes containing the antibiotic or M47 separately were included in each assay as growth controls. After 24 h of incubation at 37 °C, the lowest antibiotic concentration in combination with constituent M47 that prevented the development of turbidity was regarded as the MIC. TLC analysis of the ethanolic extract of BVIS showed at least six distinct fractions, which were visible by UV at 366 nm. The antimicrobial activities of BVIS ethanolic extract and each of the fractions were tested against test strains by the disk diffusion method. Neither the ethanolic extract of BVIS nor any of the six fractions eluted from the preparative TLC plates showed any antimicrobial activity against test strains on MHA plates at a content of 5 mg/disk (Table 1). On the plate containing sub-inhibitory concentrations of antibiotics, however, zones of inhibition were observed with the ethanolic extract of BVIS and fraction No. 3 (Table 1). The ethanolic extract of BVIS showed intrinsic antibacterial activity at the highest concentration tested (10 mg/disk), but the inhibition zone increased in the presence of sub-inhibitory concentrations of drugs for ethanolic extract of BVIS (Figure 1). The active component of the ethanolic extract of BVIS (named M47) involved in enhancement of cephalexin and ceftizoxime activities had Rf=0.47 on TLC and UV λmax =209 nm. The effect of the M47 on the enhancement of the antimicrobial activity of the tested antibiotics was also investigated against S. aureus and E. coli (Table 2). The potency of cephalexin against both test strains was increased twofold when tested with a sub-toxic concentration of constituent M47 (Table 2). Also, component M47 increased the bactericidal activity of ceftizoxime. In the presence of 100 µg/ml of M47 the MIC of ceftizoxime for S. aureus decreased from 2 to 1 µg/ml (a twofold decrease). The highest fold decrease in MIC of ceftizoxime was observed for E. coli (eight times). Table2. Susceptibility of test strains to component M47, antibiotics and the combination of M47 and antibiotics, as well as their MIC reduction folds. *MIC of combination of M47 and antibiotic. aAll media were supplemented with 100 µg/ml of constituent M47 selected during bioassay guided fractionation. bMICs values are represented in µg/ml. Standard deviations in all experiments were negligible. These results indicate that the antibacterial effect of cephalexin and ceftizoxime is enhanced by the ethanolic extract of BVIS. The active component of this extract involved in enhancing the tested antibiotics was isolated using the TLC technique. Our results confirmed that the inhibitory effect of this component on both test strains could not be observed at a concentration < 1mg/ml (Table 2). Therefore, there was no difference in M47 susceptibility between S. aureus and E. coli at tested concentrations (0.0625 - 1 mg/ml). The M47 concentration of 100 µg/ml was chosen to guarantee that the effect produced was due to the combination and not to the effect of the M47 itself. So, the effect observed in this condition could be due to the antibiotic-M47 combination. At the concentration tested, component M47 significantly improved antibiotic efficacy against E. coli when combined with ceftizoxime (Table 2). The reason for this difference is not known and merits investigation. To overcome the emerging resistance problem, studies on a combination of plant extracts with antibiotics against clinical test strains have been reported [10, 12, 13]. This is the first report of the enhancement of cephalosporins with an extract prepared from Berberis vulgaris var. integerrima seeds. Our preliminary results on the column chromatography and identification of component M47 using high resolution mass spectroscopy showed this minor compound may be categorized as protoberberine structure compounds (data not shown). Grateful appreciation is extended to Dr. F. Attar (Central Herbarium of Tehran University) for authenticating the plant sample. This study was supported by a grant from the Pharmaceutical Sciences Research Center, Faculty of Pharmacy, Tehran University of Medical Sciences, Tehran,Iran. Brag LC, Leite AA, Xavier KG, Takahashi JA, Bemquerer MP, Chartone-Souza E, Nascimento AM. Synergic interaction between pomegranate extract and antibiotics against Staphylococcus aureus. Can J Microbiol 2005; 51: 541-7. Schito GC. The importance of the development of antibiotic resistance in Staphylococcus aureus. Clin Microbiol Infect 2006; 12 (Supplement 1):3-8. Wright GD. Bacterial resistance to antibiotics: enzymatic degradation and modification. Adv Drug Deliver Rev 2005; 57: 1451– 70. Renau TE, Hecker SJ, Lee VJ. Antimicrobial potentiation approaches: Targets and inhibitors. Ann Rep Med Chem 1998; 33:121-30. Wright GD. Resisting resistance: new chemical strategies for battling superbugs. Chem Biol 2000; 7: R127–32. Cowan MM. Plant products as antimicrobial agents. Clin Microbiol Rev 1999; 12: 564-82. Liu LX, Durham DG, Richards RME. Vancomycin resistance reversal in entrococci by flavonods. J of Pharm Pharmacol 2001; 53: 129-32. Oumzil H, Ghoulami S, Rhajaoui M, Ilidrissi A, Fkih-Tetouani S, Faid M, Benjouad A. Antibacterial and antifungal activity of essential oils of Mentha suaveolens. Phytother Res 2002; 16: 727-31. Markham PN, Neyfakh AA. Inhibition of the multi-drug transporter NorA prevents emergence of norfloxacin resistance in Staphylococcus aureus. Antimicrob Agents Ch 1996; 40: 2673-4. Shahverdi AR, Rafii F, Tavassoli F, Bagheri M, Attar F, Ghahraman A. Piperitone from Mentha longifolia var. chorodictya Rech F. reduces the nitrofurantoin resistance of strains of enterobacteriaceae. Phytother Res 2004; 18P: 911-4. National Committee for Clinical Laboratory Standards. Methods for dilution antimicrobial susceptibility tests for bacteria that grow aerobically. Approved standard 5th ed. NCCLS document M7-A5. Wayne, PA, 2000. Shin S, Pyun M-S. Anti Candida effect of estragole in combination with ketaconazole or amphotericin B. Phytother Res 2004; 18: 827-30. Gibbons, S. Plants as a source of bacterial resistance modulators and anti-infective agents. Phytochem Rev 2005; 4: 63–78.